DOH-Seminole received the American Heart Association Healthy Workplace Award on Thursday, October 18th. The Florida Department of Health in Seminole County received a “Grateful Appreciation” award for our community partnership to No Limit Health and Education. The award was presented to the Office of Health Promotion and Education for valuable community engagement and outreach strategies in the community and to the Executive Leadership Team for continued partnership support. Executive Leadership Team posing with the “Grateful Appreciation” award. 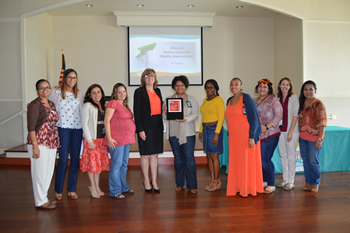 The Florida Department of Health in Seminole County’s Employee Wellness Committee was presented with the American Heart Association Bronze Level Workplace Health Achievement Designation. 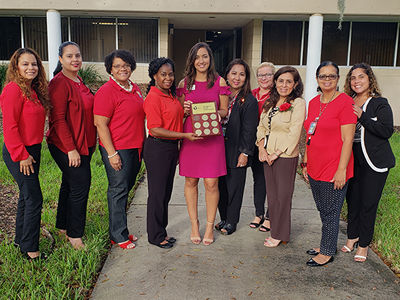 LaSonia Landry, AHA Executive Director for the Orlando Greater Southeast Affiliate of American Heart Association, recognized the Committee for their accomplishments of reaching important milestones to build a culture of workplace health with comprehensive policies and programs. 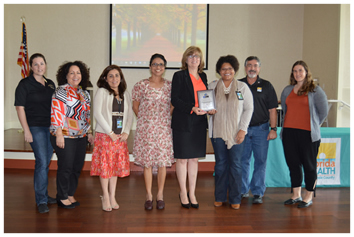 Employee Wellness Committee and Health Officer Donna Walsh accepted the AHA award.